Look everyone: it's the Xperia E! Want to spend a little less on a mobile phone but still get the latest version of Android: Jelly Bean? The Sony Xperia E has been launched and looks like it's going to be sitting alongside the Xperia Miro and Tipo in the Sony range, with some low-end specs on offer. To start, we're only seeing a 3.5-inch HVGA screen attached to this new phone, which comes with a depth of 11mm, while measuring 113.5mm x 61.8mm for height and width…dinky. To supplement the average display there's a 3.2MP camera on offer and a 1GHz processor to chug along in the background. The big features Sony is extolling are the xLOUD audio technology and 3D surround sound for those times you want to feel more immersed in your tunes. And there's also HD voice and noise cancellation on offer, so you know you'll be able to hold decent conversations with whoever you're trying to communicate with. Of course, there are still all the same Android 4.1 goodies on offer – Google Maps, Mail, Contacts and the like. Plus with the new version of Google's OS you're getting access to the intuitive Google Now. 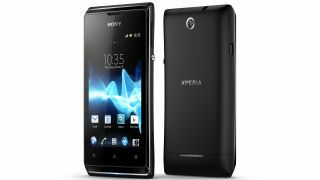 The Sony Xperia E release date is set for Q1 2013, so it won't be one for your Christmas list sadly (incidentally, we've done ours here. Check it out so you know what to buy us…). We also have no idea on price as it stands, with Sony checking into it for us. However, we're thinking the Sony Xperia E will be offered on pay as you go for around £120 when it launches – or even cheaper if we're THAT lucky.